So maybe you just asked someone a question in a text message, on social media or somewhere else online and got 'IDTS' as a response. But what does that even mean? We say it out loud all the time, but online, this acronym looks strangely unfamiliar. Just like in face-to-face conversations, IDTS is the equivalent of saying no, but with a hint of uncertainty (as if there could be a slightly possibility of it turning into a yes). The person who uses IDTS has evaluated the situation, considered all the most obvious factors and decided that something about it is false—though remaining somewhat unsure due to the potential of missing information. 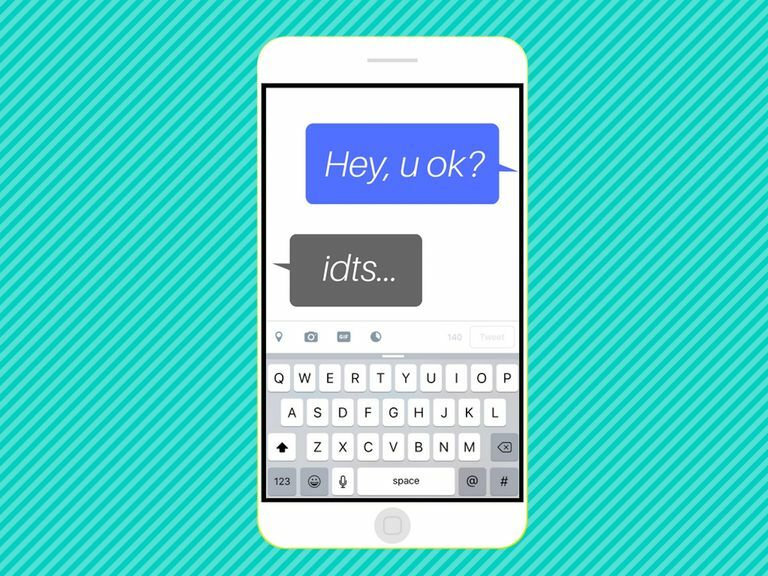 IDTS is a variation of the acronym IDT (I Don't Think) and is also similar to the acronym IDK (I Don't Know). These acronyms all incorporate a lot of the same letters, but their meanings and uses are quite different. IDTS is typically used as a response to a yes or no type of question. When the responder has settled on no as their response but can't be totally certain, they may use IDTS. IDTS can also be used in a sarcastic way. It's a lot more difficult to identify sarcasm in plain text on a computer or smartphone screen than it is by witnessing someone be sarcastic in person, but it's not always impossible. Friend #1: "Hey, did Mr. Speer say he was giving us an extension on the essay?" Friend #2: "Idts, sounds like he'll only give us longer to work on it if we go to him for revisions before the deadline." In the first example above, Friend #1 asks a yes or no question and Friend #2 uses IDTS to basically say, "No, but I'm not sure." Following Friend #2's use of the acronym, they back up their uncertainty with some extra information. Friend #1: "Omg I can't believe Shannon tried setting you up with her brother!!" Friend #2: "I know! I mean, really! Me and Tom? Ummm.... idts but thanks for trying I guess!!!" In the second example above, you can see how IDTS might be used to convey sarcasm. Friend #2 mocks her friend Shannon's attempt at something she clearly disagrees with or does not want to happen. You're having a very casual conversation. The people you're texting/chatting with frequently use acronyms themselves. Given that IDTS is one of the rarer types of acronyms, you might be better off just typing out "I don't think so" word for word. Don't expect everyone to be able to interpret it right away—even those who seem to be pretty caught up in the wonderful world of online acronyms and text lingo might have a hard time interpreting its meaning. IDW: I Don't Want. You can use this acronym when you want to say that you don't want something. IDC: I Don't Care. Use this acronym as a standalone phrase or to specify exactly what you don't care about. IDGAF: I Don't Give A F***. Yes, that's an F-bomb. This is basically an exaggerated and more vulgar version of IDC.